11.14.09 Massachussetts expert and Bowdoin College student David Plotkin scored a perfect 4.0 points to take first at the 2009 Eastern Maine Open played at the University of Maine on November 7th. The other big story at the tournament was Wesley Parker's 2037 performance rating. Tournament winner David Plotkin (right) plays Roger Hardison in the first round of the 2009 Eastern Maine Open. 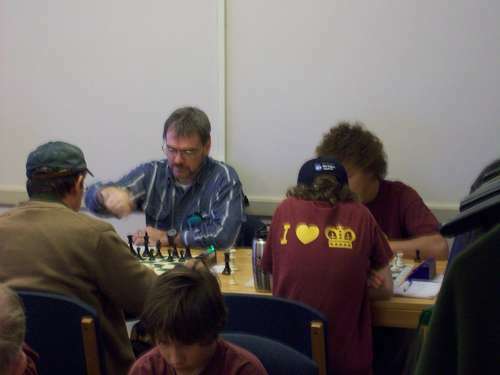 The 2009 Eastern Maine Open, played in four sections (Open, U1400, U1000 and U600), attracted 43 players from across the state. 2009 Maine co-champion David Plotkin sailed to victory in the open section with 4.0 points. Plotkin was trailed by a group of four players each scoring 3.0 points: Roger Morin, Phil Lowell, Yuri Riabkov, and Wesley Parker. Parker, a scholastic player from Cape Elizabeth, posted a stunning performance rating of 2037. Performance ratings are a measure of a player's performance for a particular tournament. Based on Parker's opponents' ratings and his final score his performance in this tournament was the same as what would be statistically expected from a player with a rating of 2037. This represents playing at level 704 USCF rating points higher than his current rating! A remarkable achievement. Congratulations to Wesley! John Bapst Memorial High School chess coach Yuri Riabkov also had a fine performance including a 658-point upset of Roger Morin in round 2. Riabkov's performance rating for this event was 2122, a whopping 754 USCF rating points higher than his rating going into the tournament. Congratulations to Yuri! Trailing the second tier in the open section were Kathy Richards (the only female player in the open) and Nicholas Parsons with 2.5 points. In the U1400 section Gianluca Pane posted a perfect 4.0 to take first by a full point ahead of Ethan Dininno. Trailing Dininno were Deanna Power (2.0), Robert Freccero (1.5), John Ellison (1.0) and Daniel Fishbein with 0.5. The U1000 section saw a two-way tie for first between John Xiang and Aaron Nevells both scoring 3.0 points. This pair was followed by three players scoring 2.0 points: John Kenneway, Langdon Holly and Nicholas Shedd. Rounding out the field was unrated Charlie Holly. Colin Smith took first in the U600 section with 3.5 points. Derek Hoyt was second scoring 3.0 points. The rest of the U600 players finished as follows: Bridger Holly (2.5), Lois Morin (2.0), Gabriel Gervais (1.5), Kyle Russell (1.5) and Theodore Brucker (1.0). Thanks to Tom Sandford for organizing and direction this tournament and thanks to Andy Bryan for contributing to this report. 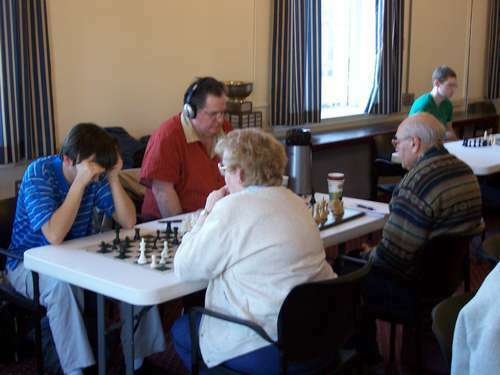 Yuri Riabkov (background right) is on his way to upsetting Roger Morin in round 2 while Lois Morin (foreground right) plays Derek Hoyt. Phil St. Jean on the move vs Michael Parsons on his way to four straight draws and 2.0 points. U1400 winner Gianluca Pane plays Deanna Power in round 1. Dan Fishbein notates his move during his game with Robert Freccero. Tournament Director Tom Sandford watches the action. 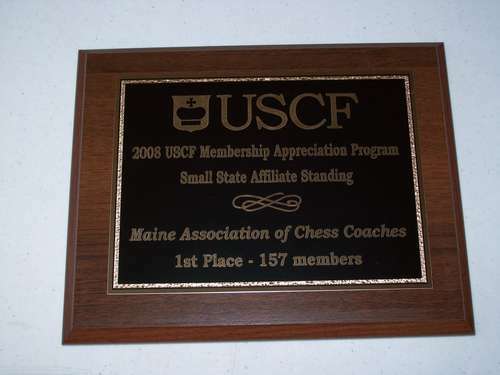 Congratulations to the Maine Association of Chess Coaches for placing first in the 2008 USCF Membership Appreciation Program for Small State Affiliates. A nice tournament that has become a solid annual event for Maine chess, thanks to Tom Sandford's steady efforts. Keep up the good work!